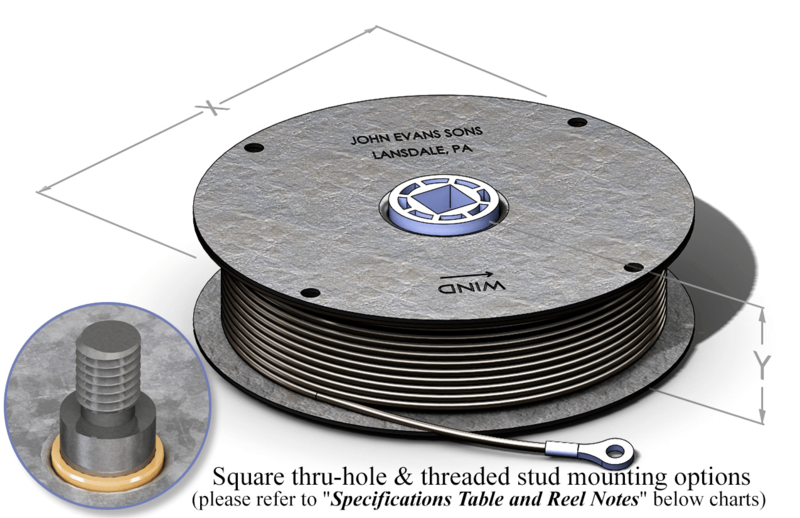 John Evans’ offers a wide array of “open style” construction spring reels, also known as arbor reels. 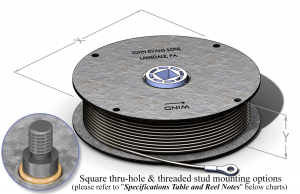 In an open reel, the cable is exposed, wrapped around the exterior circumference of the reel, and contained between two flanges & under load generated by the internal spring. Arbor reels are ideal for self-closing of doors and panels. Reels can also precisely counterbalance loads from less than one pound to more than fifty pounds. Spring reels provide lift assistance to any assembly that must be raised, reducing the “felt” weight and having the ability to make adjustments to pre-load and maximum travel. These features can also allow for motion control of doors or panels. Counterbalancing of an elevator door, reducing the force required to close and maintain the closed condition of doors on each floor. 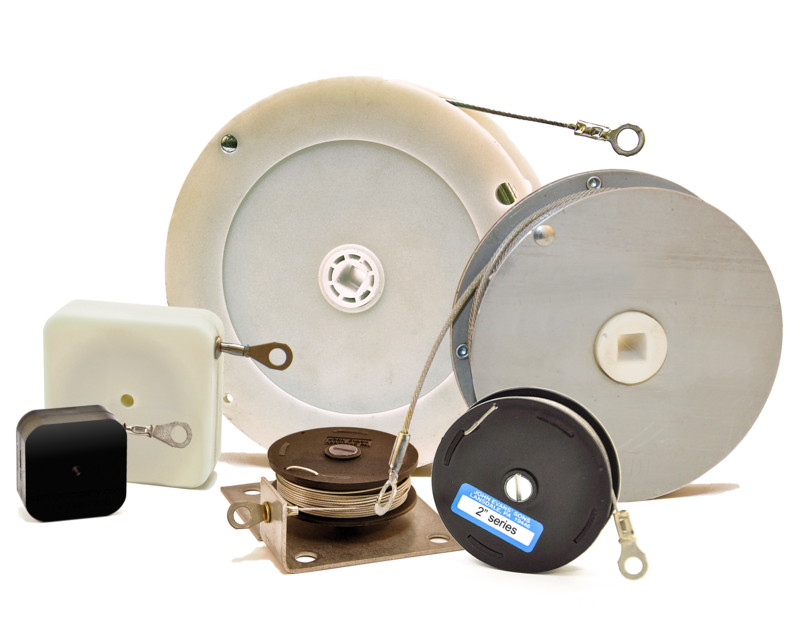 This type of spring powered cable retracting device is what is known in the elevator industry as the “Door Closer” reel or Spirator. A spring reel can be used to reduce the energy required to lift a roll-up door on delivery trucks, or to lessen the effort to open and close the door/stairs on executive jets and other aerospace applications. 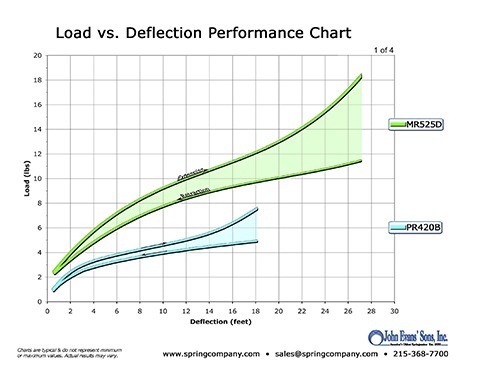 More information is available here for our aerospace applications spring reel sales sheet). Tool balancers or holders in ergonomically designed workstations are excellent opportunities for counterbalancing reels offering the ability to make adjustments to height, pre-load and maximum travel for various tools and fixtures. 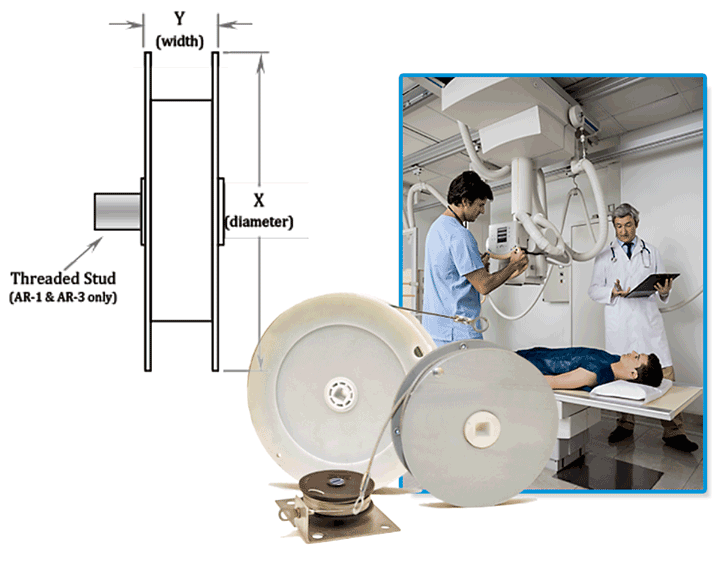 Medical equipment designers can utilize spring reels to counterbalance a movable mechanism or monitor stand in the operating theater as well as hose, cable, tubing management around or within medical electronics cabinets (click here for medical applications spring reel sales sheet). and from 3.38″ dia. thru 6.00″ dia. available with metal cases. All models of both metal and plastic are available with either a square hole Delrin plastic arbor (with a .320” square hole for mounting with a 5/16” carriage bolt) for a “bolt-thru” or a threaded stud for a “bolt-on” installation. 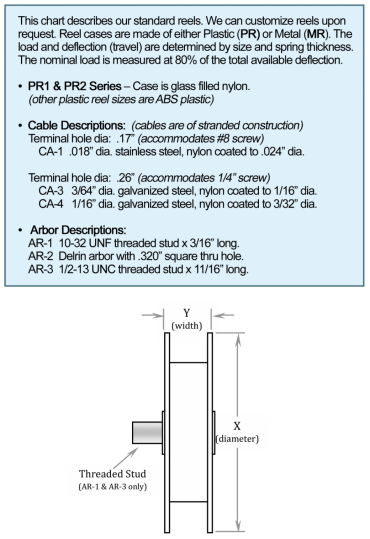 Stainless steel & galvanized steel cable with ring terminals for outer end attachment as well as arbor style configurations can be found in our Spring Reels Specifications Table & Open Spring Reel Notes (below). Various load and deflection choices are available as well as custom units utilizing our in-house engineering design assistance. Initiate a custom inquiry. 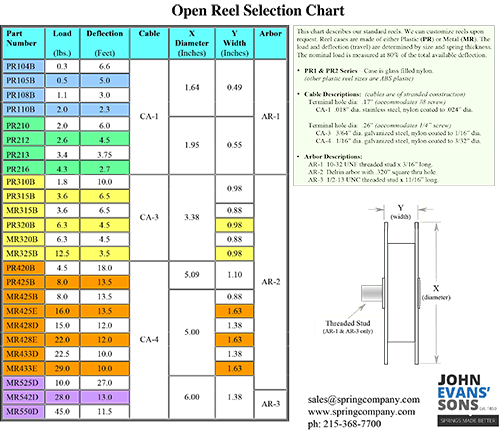 The Open Spring Reels Specifications Table (below) describes our standard reels. Use the notes shown here in conjunction with the table. We can customize reels upon request. 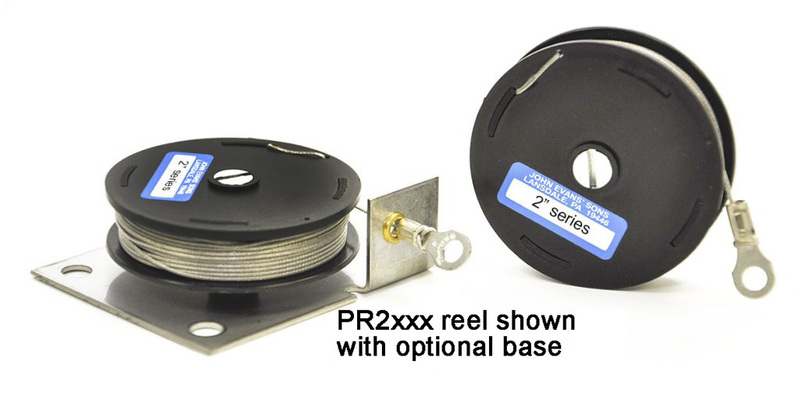 Reel cases are made of either Plastic (PR) or Metal (MR). 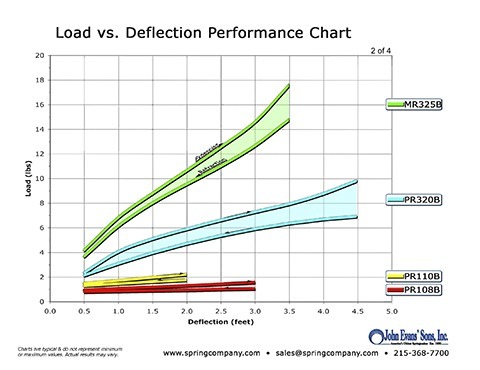 The load and deflection (travel) are determined by size and spring thickness. 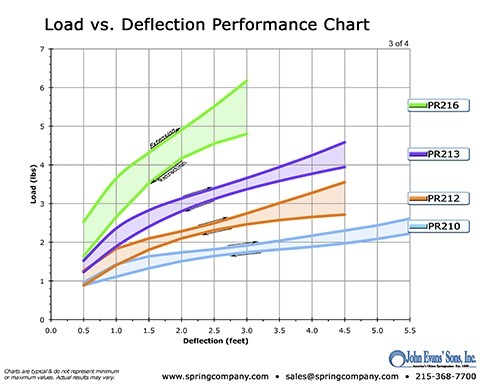 The nominal load is measured at 80% of the total available deflection. CA-­‐1 .018” dia. stainless steel, nylon coated to .024” dia. CA-­‐3 3/64” dia. galvanized steel, nylon coated to 1/16” dia. CA-­‐4 1/16” dia. galvanized steel, nylon coated to 3/32” dia. AR-­‐1 10-­‐32 UNF threaded stud x 3/16” long. AR-­‐2 Delrin arbor with .320” square thru hole. AR-­‐3 1/2-­‐13 UNC threaded stud x 11/16” long. An enclosed reel is simply an open real within a closed envelope or package. 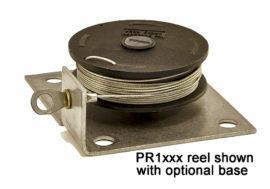 With an enclosed reel, the single function available is linear pull from the cable, which in the retracted position, is enclosed in the housing. The enclosed reels are available in a range of loads and extensions (see the sales sheet, below). All enclosed reels are made with plastic cases the enclosed reel can be installed by putting it in a cavity, by means of a mounting plate that can be supplied, or in some cases, by using the through hole. 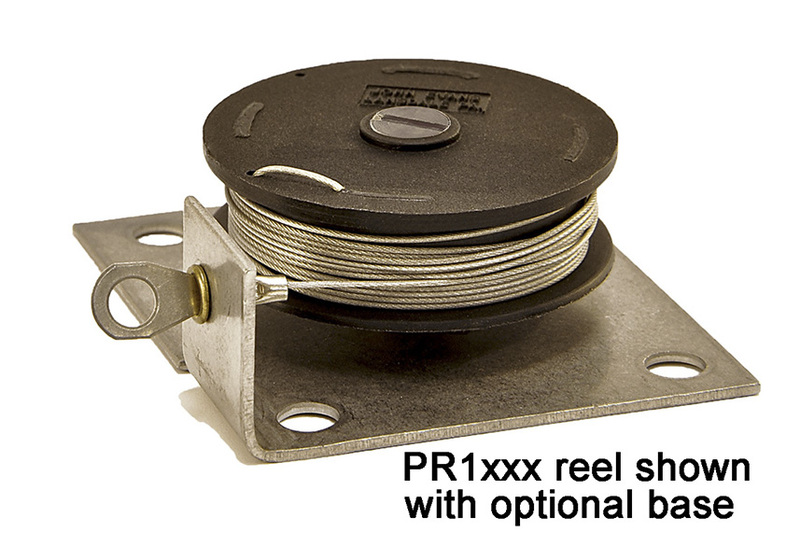 Spring reel load, extension characteristics and capacities vary with the spring used. With a given maximum extension, the load may be varied by changing the width. 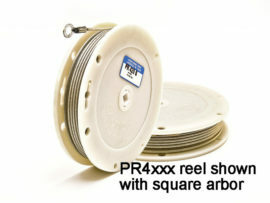 Reels are provided with attached cable, equal in length to the maximum available cable extension. Other cable lengths are available as required. 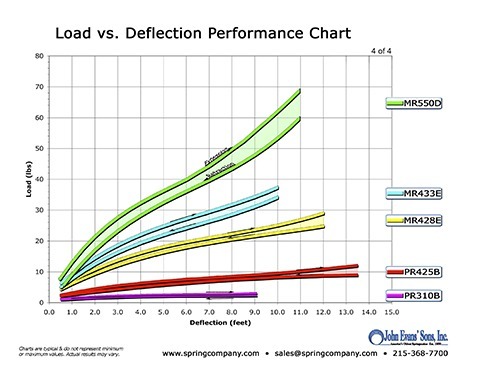 Spring reel applications typically are those requiring long deflection in proportion to the load. They include such uses as door closers, counter balances, cord retractors, retail display theft prevention, tool balancers or holders. For Point of Purchase (POP) Display and Merchandising design, our three enclosed reel product lines (spring retrievers) make excellent choices for product security and/or product placement. 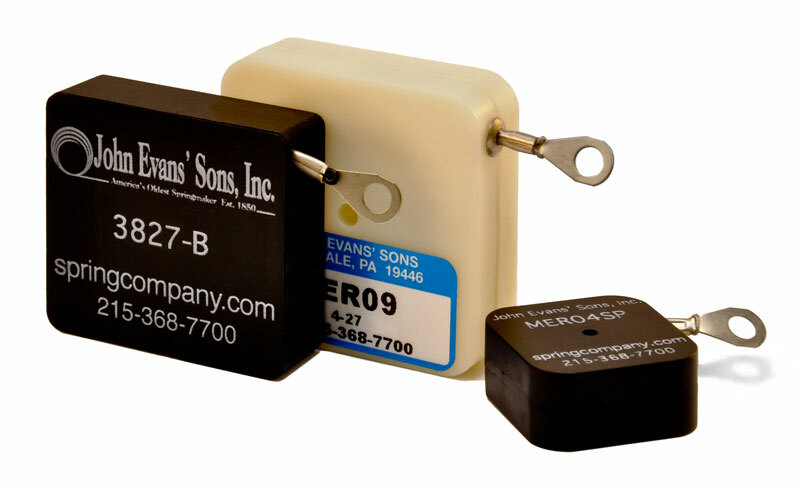 Features such as cable length, retracting load and dimensional information is available here. In addition to our standard line of reels we can custom manufacture within standard sizes and where volume or application justify, will manufacture a totally customized reel. As with all Evans' products, in-house engineering assistance is always available.